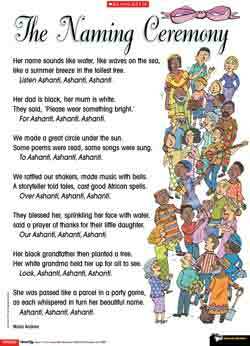 After Moira Andrew attended baby Ashanti’s naming ceremony, she was inspired to write this poem. The ceremony combined elements from two different cultures – Ashanti is a Ghanaian name – to create a beautiful and memorable event. It would be helpful if, before using this poem, young readers had some awareness of poetic devices, especially onomatopoeia, alliteration, assonance and refrains. List the following words on the board and read them aloud together: wash, splash, shush, whoosh, swish, brush. Discuss the common sound, sh, and how and what it might be describing – water, wind, sweeping. Remind the children that such words are onomatopoeic: sounding like the action. Introduce the poem, explaining it makes great use of sounds. Write the name Ashanti on the board and ask the children to read and repeat it a number of times. Ask them, as you read the poem, to imagine they are guests at the ceremony.